The CDP™4 is based on and compliant with the draft open standard defined in the ECSS-E-TM-10-25 System Engineering - Engineering Design Model Data Exchange (CDF) Technical Memorandum, see the description of the CDP™ architecture. The CDP™ allows to connect to other data sources that are compliant with this draft open standard. With this setup, it is possible to use the CDP™4 Client to connect to the CDP™4 Web Services to access a CDP™4 Back-End or e.g. to an OCDT PDS through the OCDT WSP. The JSON File Based data source allows users to connect to a file export of selected or required RDL and CDP™ Activity data. This allows users to work offline, e.g. to inspect or compare Engineering Models without the need for a live connection to a CDP™4 compliant data source. 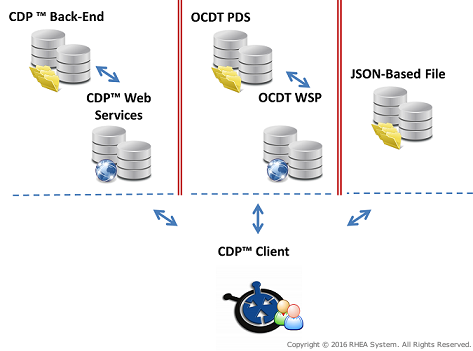 The CDP™4 Client allows to connect to multiple data sources at the same time. So long as the user has the appropriate access rights on various data sources, in principle these can be opened simultaneously. This extends to opening lower level concepts, e.g. opening multiple engineering models from multiple data sources (servers), opening multiple Site RDLs or opening multiple iterations for any engineering model. This allows the user to e.g. compare different engineering models or RDLs, both within one data source as well as on different data sources. In the CDP™ workbooks, the user can only connect to a single data source. When it is only possible for the CDP™ to open one specific instance for any particular menu item, opening a browser by clicking this menu item on the tabs on the ribbon will directly open it; clicking it again will close the browser again. When there are multiple instances that can be opened for any particular menu item, the user has to choose the required data source. In this case, the user has to select the lower part of the menu item that shows the name of the menu item, followed by the downward arrow. As an example, see the figure below, choosing to open the browser for a connected server or a JSON File. A similar approach is applied to opening browsers for all menu items. When a user has e.g. opened only a single engineering model in one particular iteration with only a default option, selecting the CDP™ Product Tree menu item Open will directly open the corresponding Product Tree. If a user has multiple combinations of options and iterations or even multiple engineering models open, the user has to select the required combination. It is partially up to the user to manage this; opening too many browsers for too many different data sources may become confusing. To help the user, for applicable browsers in the CDP™ Client, the browser title includes information to be able to identify the correct ordering in the model. In a general sense, the information that is presented is about the containing level of the information that is shown. As an example, for the Measurements Units browser, information is added to identify the name of the RDL Site Directory of the shown measurement units. Furthermore, the information in the header area for each browser always gives the URI of the data source from which the information is actually coming. This extra information is needed to uniquely identify where information in any particular browser is coming from. As an example, if a user makes an export of a session to a JSON File, and opens both the original data source and the JSON File without making any further changes, these will show the same information. The indication of the Data Source in the header area gives direct information on which browser contains what information. Note that a check-mark on the menu item on the ribbon is given for each browser that is currently open for a particular data source.